The Communist Party of the Philippines (CPP-Maoist) has spent a tremendous amount of manpower, financial and materials resources in the electoral campaign, in the process forging a tactical alliance with the landlord-bureaucrat capitalist Manuel Villar, the Nacionalista Party--and indirectly with the family of the late fascist puppet dictator Ferdinand Marcos. Totally true. That should have set the correct proletarian stand, viewpoint and attitude not only on our class enemies but that of the revolutionary forces, both working in the legal and underground, especially those advancing the protracted armed struggle towards the strategic stalemate. So why are Right opportunists allowed to have their day openly siding with the landgrabber and bureaucrat capitalist Manuel Villar? Why is the proletarian vanguard party officially maintaining an official silent stand on such traitorous, if not downright counterrevolutionary policy? The traitorous Satur Ocampo and Liza Maza and their so-called tactical alliance have confused, even lead astray, astute veteran communists in the legal national democratic mass movement. A leading academic in a leading state university says on her blog that “this unity (with the puppet and landlord Manuel Villar) on the prosecution of (arch-fascist puppet) Gloria Macapagal-Arroyo, exact justice for the human rights victims of the Marcos dictatorship, and to revisit the Visiting Forces Agreement”. How can these prententious progressives, Judases to the revolutionary cause, running for the puppet senate ignore the warnings and exposés on “Villaroyo”, that is, the outgoing fascist, puppet and bureaucrat capitalist Arroyo is secretly supporting Villar’s candidacy? Recent developments show this is not a mere black propaganda stunt of the landlord Benigno Aquino III’s public relations handlers. House Speaker Prospero Nograles and Arroyo apologist has “jumped” ship from the Lakas-Kampi presidentiable Gilberto Teodoro Jr. and into Villar’s Nacionalista Party. Nograles even openly criticized their party’s candidate. Another dyed-in-the-wool Arroyo apologist, Mike Defensor, has Villar’s tarpaulin posters plastered in his mayoralty campaign headquarters in Quezon City. No wonder Lakas-Kampi candidate Teodoro is complaining that his campaign coffer is drying up! It’s not that suddenly that the Arroyo party is out of money. Follow the money, stupid, because the ill-gotten Arroyo funds have beaten a path towards Villar. The premise of Ocampo and Maza’s Makabayan’s tactical alliance that Villar will exact justice in behalf of the Marcos dictatorship’s human rights victims is belied with the Marcoses’ overwhelming support for Villar’s candidacy. Moreover, instead of exposing and opposing the connivance between Villar and the fascist Marcos family, the Judas candidates made public pronouncements to justify their entry into the Nacionalista senatorial slate. They have the cheek to gloss over this connivance by deceiving the middle and backward elements among the masses that Villar who promised to “promote” the dictator Marcos into a hero by burying him in the Libingan ng mga Bayani, will work also work in behalf of the Marcos dictatorship’s human rights victims. Ocampo and Maza bring with them the support of the eight party-list groups under Makabayan--Bayan Muna, Gabriela, Anakpawis, Kabataan, Katribu, Migrante, Courage, and the Alliance of Concerned Teachers. I might add, lead astray these legal parliamentary organizations into being apologists that might eventually shape up towards a US-Villar regime. After all, Villar promised the Judases that he will review the puppet state’s Visiting Forces Agreement with US imperialism. As even anti-imperialist bourgeois democrats know, the puppet congress has been reviewing the agreement ad nauseam, and always the reactionary congressmen upheld the legislative fiat supporting the agreement and the reactionary Supreme Court--in gross violation of the reactionary 1987 constitution. Of course, the term “Judas” is appropriate for Ocampo and Maza, as well as those comrades behind them. Despite their efforts to convince the broad masses of the oppressed and exploited Filipino masses that they remain true to revolutionary principles, the real reason is to sell the armed revolutionary struggle for 30 pieces of silver, or millions of pesos of campaign funds from Villar, Arroyo and the Marcoses. That might be true. The question though is: who is more in a position to cheat? The masses know it was the fascist Arroyo who stole the presidential and senatorial elections in 2004, as amply exposed in the notorious “Hello Garci” call. Can the proletarian party expect to lead the inflamed spontaneous masses to rebel against Arroyo and Villar when the Judases hitched their wagon to Villar who is lagging behind in poll surveys? When it is Arroyo who still controls the intelligence services of the puppet military? The protracted people’s war can only advance towards the strategic stalemate if the proletarian party cleanses its ranks with Right opportunists who are leading the masses towards bourgeois parliamentarism. Expose, oppose, and cleanse our revolutionary united front of Right opportunists who are bent on deceiving the masses and deodorizing bourgeois parliamentarism! Persevere in advancing the protracted people’s war towards the strategic stalemate! Senator Franklin Drilon’s expose’ on the Savannah Subdivision Project of Manny Villar’s real-estate company, Savannah Communities, cracked open the “tip of the iceberg.” Manny Villar accumulated riches in his real-estate businesses by violating Philippine laws that prohibit the conversion of irrigated agricultural lands and by directly sabotaging the CARP distribution of lands to the landless tillers. The Savannah case of Iloilo and the numerous business engagements entered into by Villar, caused the land conversion of precious rice and corn lands all over the country, to give way to his unreasonably priced so-called “low-cost” housing projects. His mode of operation runs contrary to what the Villar-Nacionalista platform declares. Villar paid his way through bribery in DAR, the Registrar of Deeds and DENR to effect the unlawful conversion of CARP lands. How can he clean the government of grafters and corrupt officials if he himself is one of them? Villar exemplifies the classic Philippine ruling class elite. He may have grown up in Tondo ages ago and crawled up to college through “sipag at tiyaga.” But when he used his in-laws’ (the KBL warlord Filemon Aguilar of Las Piñas) to capitalize his real-estate projects and built up his own wealth as the Filipino Taipan, he already crossed “class lines” and became ‘traitor’ to his original class, anakpawis. As a top government official who use power and influence to further aggrandize himself with more wealth and power, Villar is now one of the leading Bureaucrat Capitalists of the Philippines. Villar’s political party, the Nacionalista Party is one of the oldest traditional elitist Party which sprung up from the old Partido Federal of the Philippine Assembly days in 1930s. The Nacionalista party together with the Liberal Party were the political enclaves of the filthy rich ruling classes when the two-party political system came up. The rich sugar barons, shipping magnates, logging magnates, tobacco monopolists, big-bankers occupied seats in the national legislature and executive offices, divided between the Nacionalist and Liberal parties. When Ka. Amado Guerrero wrote the “Philippine Society and Revolution” he identified the members of the two parties as the bureaucrat capitalists who are ‘lapdogs’of US Imperialists in the country. The ‘ugly head’ of right opportunism looms over the top CPP leadership. No less than the CPP's 41st Anniversary Statement on December 26, 2009, unabashedly unfurled its support for Manny Villar and the Nacionalist Party. 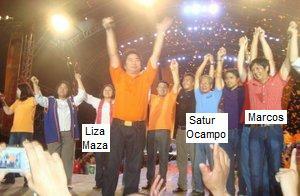 Now dear comrades and friends, where is the Nacionalista Party here. Why wasn’t it mentioned as one of those anti-national, anti-democratic and anti-people ‘trapo’ parties. Has its basic reactionary character changed? Any political analyst will conclude that the CPP has selected Villar as its candidate in the May 2010 elections. And this was widely made public, as the statement was published in the official website of the CPP-NPA-NDF and were released to the national broadsheets. The endorsement was corroborated by the inclusion of known CPP comrades, Satur Ocampo and Liza Maza, as candidates in the Nacionalista Party official party slate. Bayan Muna, Gabriela, Anakpawis, Kabataan Partylist chapters are actively postering and campaigning for Manny Villar as their presidential bet in their bailiwicks. The CPP grapevines report that Villar contributed as much as P60M to the CPP treasury in exchange for a 3M command vote delivery. “The gods must be crazy,” this was the comment blurted out by a CPP party member in one of their collective meetings. "The CPP leadership framed a five-year plan to build up revolutionary capacities to attain a strategic stalemate with the reactionary regime. The basic requirement was the massive recruitment of 200,000 party members, the enlistment of NPA commanders and redfighters to fill up 60 platoons more in order to increaase the guerilla fronts from 120 to 180 nationwide." "These can only be achievable if millions of oppressed masses have lost their confidence on the existing bourgeois democratic system and opted for socialism and communism; if the masses will decide “not to live in the old order” and wage people’s war to bring down the ruling political system. And now here we are calling on the people to participate in elections and vote for progressive senators and a reactionary presidentiable," the comrade said. If the masses will be encouraged to participate in the reactionary elections; if the people will be asked to pin their hopes on bureaucrat capitalist demagogues; if they can not distinguish Satur Ocampo from Manny Villar and Loren Legarda and Bongbong Marcos, then the CPP leadership have towed them away from pursuing the victory of people’s war. The negotiations with Villar and the Nacionalista Party were initiated by the CPP exiles in Utrecht under the leadership of Jose Ma. Sison. Satur Ocampo and his Bayan Muna and the United Front cadres of the CPP are under his tutelage. The funds generated from the traditional elites who negotiated with the CPP leaders and Bayan Muna goes to their electoral organizations and Utrecht leaders. If ever, there are lesser funds, generated through the “permits to campaign” and revolutionary taxes controlled by the guerilla front-based party echelons. There is now an ongoing tug-of-war for resources between the leftist ‘politicos’ living in style and the comrades living austerely in hard struggle in the countrysides.